7. The next selection is "Display Ad On". You can choose from My IBOsocial Profile, Other Member IBOsocial Profiles, IBOsocial.com Main Page, IBOtoolbox Newsletter, IBOgigs, IBOtoolbox Wall. You can select to have your banner ran on 1 or all of these different locations. 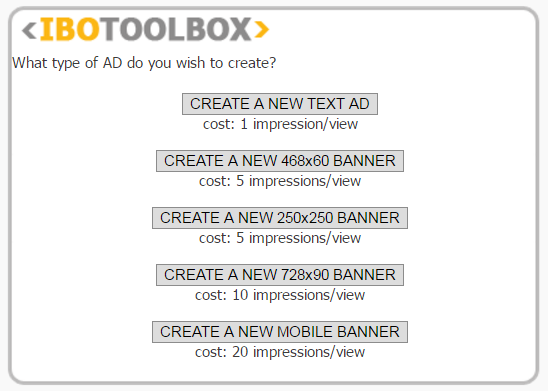 Running ads at IBOtoolbox can get you more exposure for your business than any other paid or free platform can! IBOtoolbox's advertising system will bring in the most targeted audience that you will find anywhere on the Internet. Because IBOtoolbox receives over 300,000 visitors daily that are looking for business opportunities they can make money with and they are finding your products and services through search engines or through IBO's vast social media network. This a non-incentivized visitor/prospect base - the best there is! You will generally find a better click through rate on banner ads because people respond better to graphic images. Banner ads ran at IBO average a click through rate of 3-10% although many members have reported higher rates! Other factors that determine your click through rate are the banner size, where it is ran on IBOtoolbox.